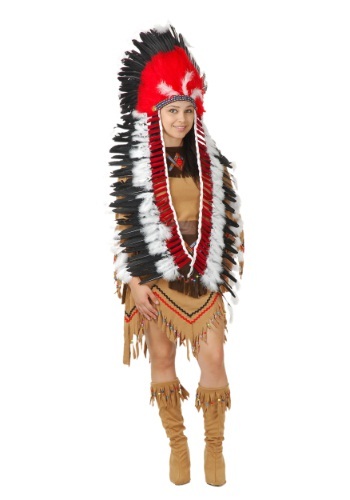 This headdress is Native American-inspired and includes long trailers down the side. The faux feather headdress maintains your comfort with a felt backing. The feathers and headdress trailer are both long, giving you almost a wingspan of decoration. Many feathers are attached. The stylized front headband is bright red with other varying colors on the rest of the piece. Unquestionably, this ornately detailed headpiece, while not authentic, looks like the kind seen in film westerns.